Commercial products have nutritional labels, which aims to allow customers to know if these products are good or bad for their health. The first summarizes the positive aspects of the food: the Score for compliance with Individual Nutritional Recommendations or SAIN, It is an indicator of nutrient density that is to say, a ratio nutrient / energy estimates the average compliance of Recommended Dietary Intakes (RDI) for several nutrient. The second indicator, called LIM, summarizes the unfavourable aspects of the food. It measures the nutrients for which consumption should be reduced, such as salt, saturated fats or added sugars. We will also use the name "Fat, Salt, Sweet" for this indicator. For each ingredient individually present in recipes on What Foods, it was added foods with nutritional compositions are provided by these two databases, which allows to use these two indicators. What Foods applies this indicator on recipes and for the nutritional analysis of your diet, displaying a value on a gauge with colours ranging from dark green (below the threshold of acceptability, or level 1), light green (level 2), orange (level 3) to red (to be avoided if possible, or Level 4). using three nutrients used in the Nutrimeter®: Sodium, SFA, Carbohydrates. In 2007 an INPES human nutrition research team from Marseille (INSERM, INRA, University) presented a nutrient profiling system based on the use of two indicators. The first summarizes the positive aspects of the food: the Score for compliance with Individual Nutritional Recommendations or SAIN, It is an indicator of nutrient density that is to say, a ratio nutrient / energy estimates the average compliance of Recommended Dietary Intakes (RDI) for several nutrients. 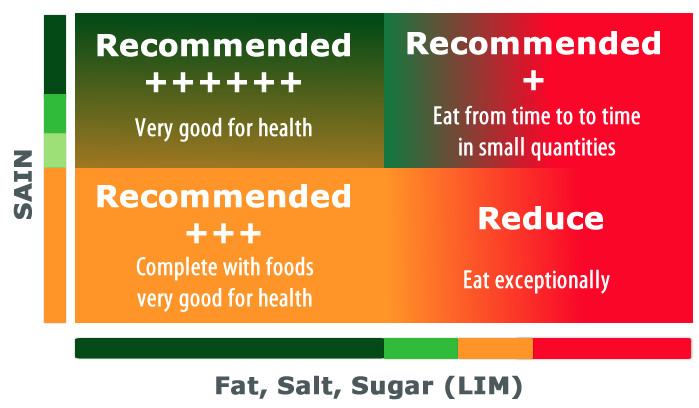 The second indicator, called LIM, summarizes the unfavourable aspects of the food. It measures the nutrients for which consumption should be reduced, such as salt, saturated fats or added sugars. By plotting their two values on a graph 620, different foods have been screened. Then two thresholds of acceptability (SAIN> 5 and LIM <7.5) were applied to classify the foods into four categories. The SAIN - LIM system allows a separate evaluation of the positive and negative aspects of each food considered individually. Thus, several dishes sold under the same name (cassoulet, for example) may be classified differently depending on the ingredients, recipes and processes used. This method has some shortcomings. In its current version, the system classifies all added fats in the same category ("reduce") without distinction, especially between animal and vegetable fats. SAIN-LIM system was developed by Michel and Nicole Darmon and is described in their book: balanced diet. Basic concepts and new indicators: SAIN and LIM. Editions Tec & Doc Lavoisier. July 2008.